As a true solar geek, I can’t think of anything better to do at 7:30 on a Friday evening, than log in to my solar panel monitoring system. While most folks are settling down to Friday Night Footy, you’ll find me checking out how much power my 6kW of micro inverter solar panels are producing as the last rays of evening sun scatter across my roof. As I logged in tonight to see a respectable 1.2kW being pumped out, I noticed that the monitoring system was providing a great example of one of the benefits of microinverter technology. If you have a gander at the live monitoring screenshot below you’ll see that I’ve highlighted the position of my wood burner’s flue and the approximate shadow it casts as the sun goes down. The red circle is my flue. I’ve drawn on its 7:30pm shadow. Now, the interesting thing to note (for a solar-geek anyway) is that the panel next to the flue is at 10W and the panel next to it is 37W. This compares with all the other panels which are sitting pretty at about 54W. Obviously the 2 underperforming panels are suffering from the flue’s late-evening shadow. But the cool thing is that the shadow is only affecting those 2 panels. 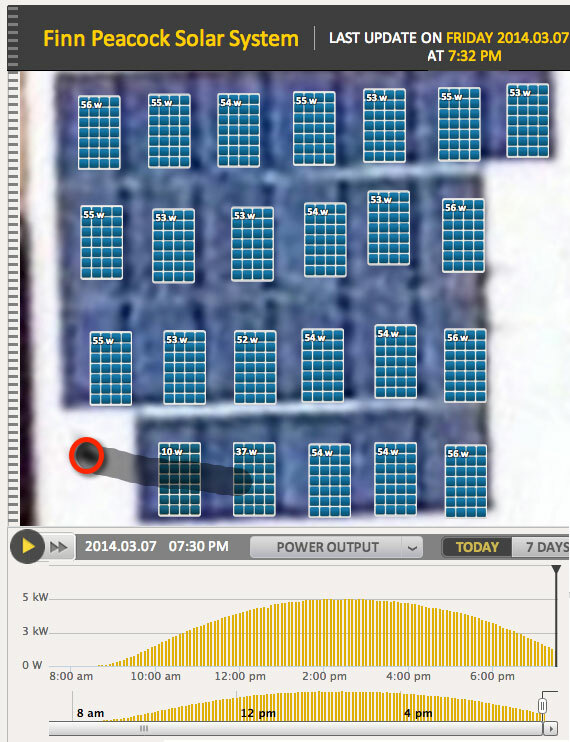 The other 22 panels are rocking along without any reduction in power giving a total of 1.2kW in the late-evening sun. If I had a central inverter and all these panels were in series, then all the panels would be forced to the same power as the worst performing panel. In other words I’d only be getting: 24 x 10W = 240W from the system as a whole. 80% less power! For a rundown of both the advantages and disadvantages of microinverters I’ve put together a summary infographic here. Previous Article: ACT Feed in Tariff lives again! Next Article: ANU and Trina Solar Panels smash solar efficiency targets. GFIT in NSW.I will possibly upgrade mys 1.5Kw system at that time depending on incentives .What are your thoughts on this idea? I honestly think it would be cheaper to install a whole new 2kW system with microinverters that modify an existing system! Also you could do this now without affecting ypur GFiT. A vagrant thought:- covering all bets. What about the opposite case? If circumstances change and DC power is required is it possible to remove the micro-inverters and reconnect the system to run DC/charge remote battery-banks, etc.? I presume the ‘AC panels’ produce similar outputs as ‘standard’ DC ones? ps _ I note the links you provide are being very coy about publishing pricelists; are they really that much more expensive? What’s the going price for a 3kW-ish microinverter system nowadays? Do they seem to be getting more popular? My background: badly shaded house on coast in West Oz. Sep 2013: Installed 3Kw of Renesolar panels (12 * 250w) with 6 APS mini-invertors & APS ECU for $5,000. Finn Peacock please note price – $1,000 to $2,000 less than you, no special price gouging involved at my end. Result: system works really well*. Atypical coldest winter for years had net -226Kwh over 2 months, -58Kwh for next 2 months. Overall in 18 months, sent 5473 to grid, received 3673 back (and got slugged for the “privilege”). My question: given too many power outages here, which would you do first (given fairly limited budget) installing an isolation switch (circa $1500), installing a few more panels & inverters (about $3,000 for another 2Kw) or installing some battery backups and going off-grid altogether (cost unknown to me yet)? * Except a massive TV & radio problem from the micro inverters. Solved by moving the actual radio and the TV aerial. To their credit, the installer helped me troubleshoot & fix the issue. I have been surfing the net for a few years trying to get answers that are meaningful and understandable regarding solar power for my home. Your web site covered all my concerns and eased my worries such that I now await a quote from your recommended installers. I have had a couple of quotes in the past year but was dazzled by jargon and disappointed that the consensus was that because my installation would face west I would not get a great benefit from solar! Your site suggests otherwise so I wait eagerly for a positive offer at a respectable price. You talk my language Finn so thank you for your efforts in clear communication. Who is right where solar panels are made? Are Australian solar panels better than overseas or vice versa? The quote I have for 20 Solar Panels is the same as the quote for 12 Solar Panels. Who is quoting way over/under the needs for a $500.00 quarterly electricity bill? Where should the Solar Panels be installed on the flatter roof or the steep gable roof? The 3 Installers I sent your details to were: SAE, Beyond Solar and Energy Aware. For example, if your gable is 60 degrees from horizontal, north facing, you’ll get a 90% yield compared to the perfect angle with is 30 degrees. The bonus of a steep roof is that you get more winter generation – and less summer generation, so you get a more constant performance through the year, This is generally an advantage. As you can see from the table, a flat roof will give an 87% yield. I don’t like flat roofs with regular panels – as the water pools – and can lead to premature seal failure on the frames. They also do not self clean in the rain. I’d seriously consider the gable roof. Be careful with the language you hear. The *only* Australian Made panels are Tindo Solar. “Australian Owned” means they could be made anywhere. Any insights as to why this would be? You’ll probably find that all the models are compatible with your 60 cell panels. I think the ‘well-suited’ argument might be about economics, and inverter oversizing. Generally the lower powered micro inverters are a bit cheaper – so it can be more economically efficient to pair a 260W panel with a 215 to 230W inverter, because the 260W panel will very rarely operate above 210-230W. P.S. The 230W Enphase is an ‘S’ series: ‘S230’. i.e. 5th generation. If you can get that for the same price as the ‘M’ series go for it – as it should be slightly better performing and even more robust than the 4th generation ‘M’ series. I’m due to get some quotes from your system in the next few days, but looking for some information which would help me talk sense to the potential installers. I’m in Perth, have a 3phase installation on a recently completed house using about 40kWh per day, am on a flat rate (don’t think there’s any other option here) and have a Landis & Gyr E350 3phase 4 wire meter badged by Western Power as U3300 and dated 2013. I’ve only a small area available for panels which is subject to heavy shading in the afternoons. Do the microinverters, which I suspect would be essential in this case deliver entirely to one phase? What happens if the power use at the time is not on that phase? Do I end up exporting cheap power on the PV connected phase and importing expensive power on the demand one? Hopefully the meter instantaneously nets out the power imported/exported irrespective of phase so when my demand on any combination of phases exceeds that which I’m generating (on whatever phase that is) my meter is showing my consumption as the demand less the generation. Common sense suggests that’s probably what happens, but that’s often in rare supply and I’d like to be sure. Would appreciate your wise words. While he doesn’t discuss microinverters specifically, your installer can balance them across all three phases or in a way that is most appropriate for your set up. The way billing works means you should be treated the same as if you were on single phase power. That is, only the net amount of electricity imported or exported is considered, regardless of what happens on individual phases. Many thanks for raising my consciousness on this. I suspected I was fretting about nothing and you’ve confirmed it. Thanks again. Will clue myself up further with your link to Finn’s note. 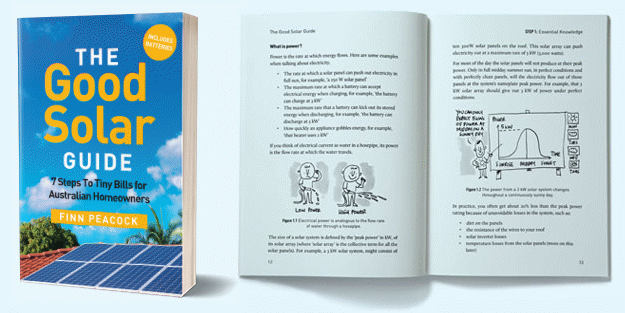 Hi Finn – what’s your advise on retro fitting my current 5kw Solar panel system with micro inverters? We’re situated in Tasmania and unfortunately the way our multiple Tarriffs are organised (Aurora Energy), our system isn’t being fully utilised. Is the cost of fitting micro inverters to my 20 x 260w panels a viable option and if so would it improve my efficiency? If your panels are unshaded for all or almost all the day, then fitting them with microinverters will improve their output by around 5%. If they suffer from more substantial shade then microinverters may increase their output by around 15%. Now apparently, it is possible for an improvement of up to around 25% but that is only likely under exceptional circumstances. Or you may find that investing in energy efficiency, for example a heat pump hot water system or double glazing, may provide a better return. what is a good solar inverter?